The women in the weaving room at the Crossnore School & Children’s Home bring a century’s worth of artistry to life with their looms. The bus has found its way — wound its way — to the small mountain village that’s no longer a village, but a historic community. No, a neighborhood. No, a school. No, a children’s home. No — well, no matter. This is Crossnore. The bus’s occupants are lined up, snaking through the stone building around shelves and tables and hanging displays of scarves and ponchos, shawls and shrugs, place mats and napkins and tablecloths. The women fairly tinkle and chime with the rows of medals and charms that are pinned to their chests and lapels and shoulders. These are members of the DAR — Daughters of the American Revolution — patiently waiting this Saturday to purchase the handloomed products of the Crossnore Weavers. Do they realize they’re continuing a tradition that stretches back some seven decades? In the adjacent room, four women at looms use their calf muscles and biceps, fingers and toes, to push treadles and shove shuttles, continuing a Crossnore tradition that stretches back even longer: handloom weaving. Watching the weavers, the muscle memory is still there, years and years later, from when I signed up and waited and waited for my turn, my morning, my hand towel, at one of Camp Yonahlossee’s two looms. The lean forward, the push downward, the swift horizontal flight of the shuttle. The noise, a woodenish mixture of rattle, thump, clunk. And the comfort of it all: the steady, repetitive movement. A gradual inch upon inch of fabric and familiar design where once there was a void. Your fellow workers, intent and industrious, watchful and patient. The weaving room at the Crossnore School is nearly as old as the institution that it’s part of. The school, founded by doctors Mary Martin Sloop and her husband, Eustace, was incorporated in 1917 to educate Appalachian children. 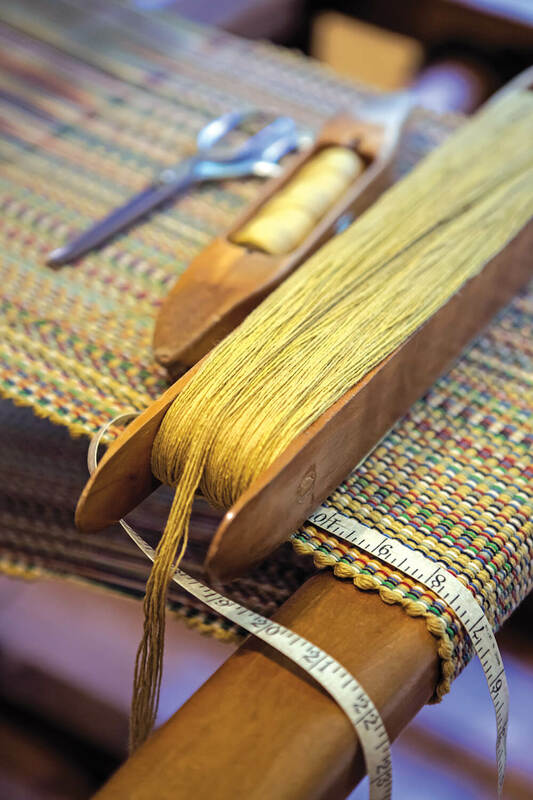 The weaving program, which began in 1920 and was modeled after that of Berea College in Kentucky, offered instruction to both children and women in the community. In 1929, five chapters of the DAR in Charlotte helped fund the construction of two adjoining log buildings to house the expanding program. The woven goods were sold — at DAR conventions, among other venues — to fund the school’s needs. 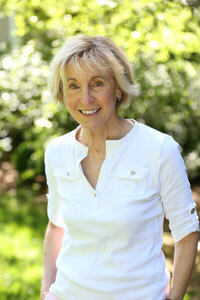 “I need to do a black chenille stole,” Christy Smith says. 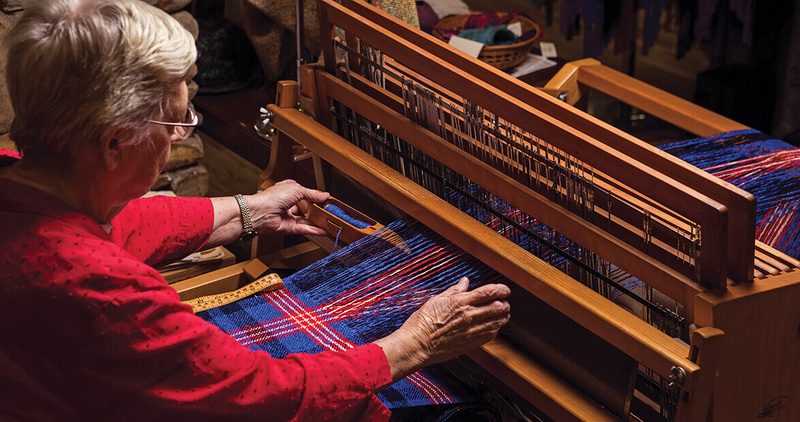 Christy, one of nine Crossnore Weavers, has been weaving for just over a year. Later, after school, the youngest weaver, age 15, will arrive to weave bookmarks and coasters. (After all, you’ve got to be old enough, tall enough, to reach the treadles.) In the adjacent room, a pair of finishers fringe and knot completed goods. Now you know why those 700-count sheets are so expensive. If you’ve never understood the phrase “threads per inch,” which has become the marketing standard for sheets, stand beside a Crossnore loom. Vertical yarns, or the warp, are crossed at right angles by the filler, or weft. A shuttle of thread and, depending on the weight of the thread, a bobbin, are passed by hand from left to right, through the right-angled space. Bang! That’s not the bang of a firecracker, but the bang of what is, reasonably, called the beater, which the weaver yanks back — hard — to secure the threads. That noise is repeated many, many times, until an inch of textile is measurable. Now you know why those 700-count sheets are so expensive. And they’re woven on immense machines run by computers. The log cabin burned to the ground in October 1935. Again, the DAR stepped in, with loans, as did the Crossnore children, who, instead of money, gave of their time and their strength, ferrying stones fireman-style from the nearby Linville River to construct a new cabin. Throughout the particularly frigid winter of 1935-’36, outdoor fires surrounded the new building so that the mortar could dry, rather than freeze. This is the same weaving room that stands today, open to the public as a “living museum.” Imagine someone watching you cook, stepping behind you to examine your pantry or sticking a finger in your homemade split-pea soup. At Crossnore, you’re welcome to do the equivalent of just that: Examine the eight wooden looms upstairs (another 30 looms reside downstairs), including one that dates back to the New Deal, for which — and during which — it was made. Go ahead, stroke the tablecloth emerging, bit by bit, from Lisa Banner’s loom. Sunshine falls through the windows on photographs of Crossnore’s renowned weavers of the past: Lillie “Aunt Newbie” Johnson (35 years in the weaving room); Ossie Phillips (60 years); and others. It brightens the yellow wall where a thick thread joins significant dates in the weaving room’s history — its founding, the fire, its designation as a National Historic Place in 2001 — with examples of patterns such as Lee’s Surrender and Chariot Wheel, several of which were commissioned by or presented to U.S. presidents. The sunlight warms the golden hardwood of the floor, where baskets of bouclé, wool, alpaca, pearl cotton, rayon, and linen — the most difficult fiber to work with, even for Virginia “Granny” Coffey, age 83, who’s been weaving for 30-plus years — sit amid rolls of paper wefts and cardboard cones of thread. Granny’s working with alpaca this morning, which eventually “feels like I’m wearing clothes made of steel wool,” she says. Given the choice, she’d rather weave with bouclé. The women sit on benches padded with shearling as they complete an order of 12 napkins that are as multicolored as the biblical Joseph’s coat. The sunlight gleams on indigos and violets, golds and emeralds, and on the plain cream of a tea towel embroidered with a solitary cabin, long an emblem of the Crossnore Weavers. Outside, a creek gurgles. 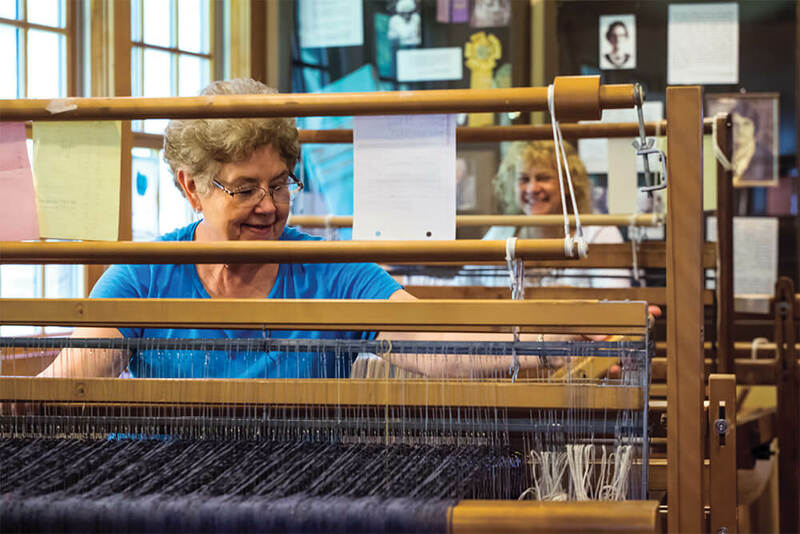 Inside, you’d like to curl up like a cat in one of those baskets of yarn — lulled by the rhythmic clunks and thumps, secure in the gentle miens of the workers who are still weaving not only wearables and heirlooms, but also history — and just stay forever.